If you haven’t been paying close attention it’s possible this may have completely slipped past you, as it seemed to happen almost over night. 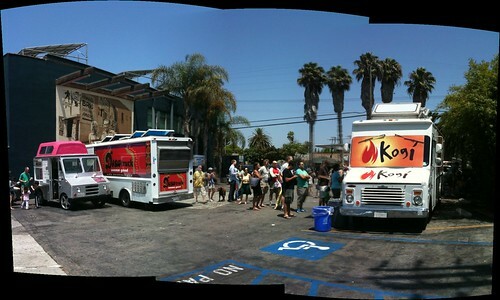 Everyone in LA should already know about the Kogi BBQ truck and it’s famous twitter account announcing where you can find eats at any point in the day. But what a ton of people don’t know about is that Kogi is just the tip of the iceberg. In the first part of this year super delicious food trucks with matched twitter accounts have been multiplying like gremlins at a water park. This is basically a business model that didn’t exist 12 months ago and is now making bank for a growing number of mobile eateries. It makes sense if you think about it – make super tasty food that instantly attracts a loyal following and then not only drive it directly to them, but send them text messages to let them know when it’s within scarfing range. I know that anytime I see a tweet from the Marked5 truck saying they are in my neck of the woods I rush over for snacks. I’m sure there are more I’m missing – If you know others I’m missing please post in the comments. Personally, I’m super excited about this trend and can’t wait for more grub to go mobile and start hanging out on my block. If the gods of the food truck are listening, I’d like to request a Scoops and Pure Luck truck ASAP. kthx. 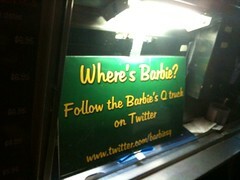 UPDATE: Check out this aggregator of tweets from the trucks created by Michael Pusateri. Man, I’m hungry. Better go check Twitter. Link to Dosa Truck doesn’t work….help? yum. Mega cool. Thanks for the info. Get Shaved is awesome. But Dosa Truck?! Who knew. Must try this out. Thanks for the page Michael! Next PostNext In your face, Mt. Baldy!